Chill out, pal. Relax. Just don’t smoke a cigarette. Tobacco may make your anxiety worse instead of better. 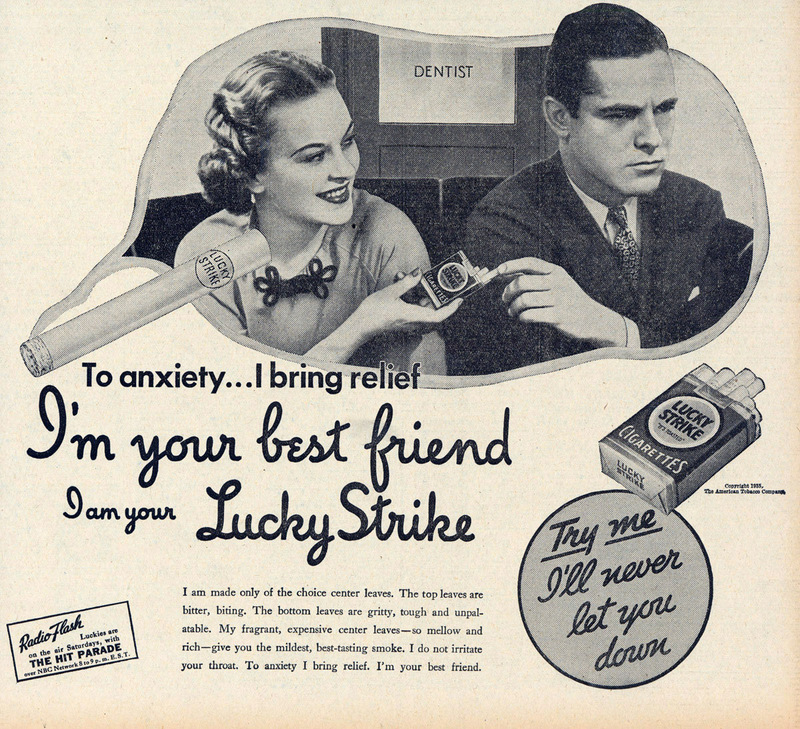 Tobacco ads once implied smoking improved your health by reducing anxiety. Ha-ha! Good one, guys. Máirtín S. McDermott, Theresa M. Marteau, et al, tracked 491 smokers as they tried to quit. After six months, 76% of the participants had relapsed, and only ten of those with a psychiatric diagnosis (mostly anxiety and depression) were still tobacco-free. Those who quit reported their anxiety score went down by an average of seven points, while those who relapsed scored three points higher than before. Which group saw their anxiety drop the most after they quit, or soar the highest when they relapsed? Those who said they smoked, “to cope,” as well as for pleasure. All the usual caveats apply. 491 smokers is not the world’s largest sample. Pharmaceutical companies didn’t pay for the study, but they’ve paid McDermott to work on smoking-cessation before. A different study recently found exactly the opposite effect; these researchers believe low doses of nicotine (not standard doses or high doses) may clog a subclass of the brain’s nicotine receptors so they can’t relay anxiety signals. On the other hand, those researchers studied mice rather than people, and most first-time smokers report nausea rather than serenity. Too many people smoke, and too many rationalize tobacco use by saying, “I need it for my nerves.” We can boost our client’s motivation to quit by explaining tobacco actually seems to increase anxiety – through our fears for our health, if no other way.